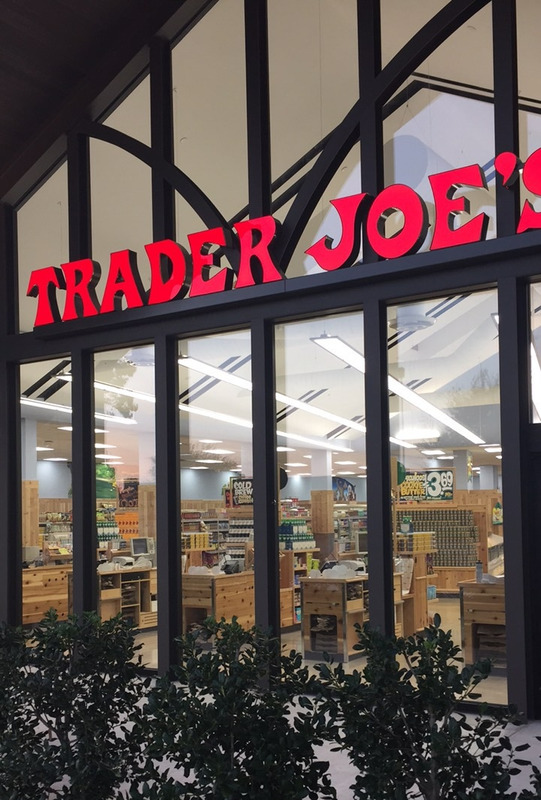 The big league city that is Oklahoma City, and the place I call home is FINALLY getting a Trader Joe's. Officially opening Friday the 23rd at 8am. I can hardly stand the wait. I'm not the most experience Trader Joe's shopper, for obvious reasons, but I do have some tried and true favorites I pick up on the rare occasions I'm in the same city as a TJ's. Today I'm sharing my 10 faves, as well as 10 items I can't wait to try. I stalk every blog post, article, report, instagram feed, etc. that devotes itself to the best Trader Joe's products. I feel confident I've come up with a well crafted list of things to try. 1. Raw Crunchy Almond Butter This is without a doubt my favorite almond butter. It's very thin and needs a good stir when you open it, but it's perfect for that almond butter drizzle over oats or smoothie bowls all foodgrammers dream of. And #teamcrunchy just cause. 2. Cashew Butter Just like the bottle says it's creamy and salty and delicious. Cashews are my favorite nut so I obvi wig out over cashew butter. So great with apple slices, but also perfect for savory things like dipping carrots & broccoli into or for asian sauces. 3. Rolled Oats This massive bag is so cheap and lasts forever. Makes a great bowl of oatmeal, but I mainly use this big bag more for baking or making granola. 4. Tomato-Less Corn Salsa With chips dipped straight in or served over tacos, fish, chicken or in taco salad! 5. Macadamias mix Gingerly with Cranberries & Almonds Trail Mix Okay so look past the Omega Trek Mix image and into the background. This was my DC discovery and helped me get through the afternoon slump of my summer internship. The little bits of crystalized ginger are the best part and makes it my favorite trail mix EVER. 6. Feta Dip This one's for you Anna! When I visited Anna this summer I was greeted with a glass of rosé and this feta cheese spread served with pita chips. We scraped the container clean despite the dinner reservations we had. 7. Body Butter TJ's has some sneaky awesome beauty products that shouldn't go overlooked. I picked this up on a whim and it works so well for my dry eczema skin. The pumpkin version is faboo too. 8. Cookie Butter Cups You live under a rock if you haven't heard of cookie butter. It's kind of like Trader Joe's mascot. Unable to eat Reese's cups, these cookie butter cups are the perfect replacement and most likely better IMO. 9. Greek Yogurt Say hello to my breakfast every morning the summer I lived in DC. At only $0.99 a cup, they were perfect for my wallet and appetite. I love pomegranate and vanilla bean! 10. Green Tea Mints This was an impulse check out purchase that I didn't regret. Actually so good and great for after lunch. 1. Bollywood Popcorn 100% buying this. Jai ho! 2. Frozen Falafel Wrapped in a pita with tzatziki? Yes please! 3. Frozen Vegan Tikka Masala I'm not a frozen meal person, but this one is on just about every list. 4. Parsnip Chips Intrigued! Dipped in hummus or guac. 5. Honey Sesame Almonds Trader Joe's nut section is dreamy. These almonds, coconut cashews, truffle marcona almonds, chili lime cashews etc. all at the best prices. I can't wait to try these. 6. Riced Veggies (Cauliflower and Broccoli) To sneak into smoothies or as a rice alternative! 7. Balsamic Glaze Perfect on my Roasted Sweet Potatoes and Figs. 8. Sweet Potato Gnocchi I tried to make sweet potato gnocchi one time and it was such a fail. I'll leave it up to trusty Trader Joe's instead now. 9. 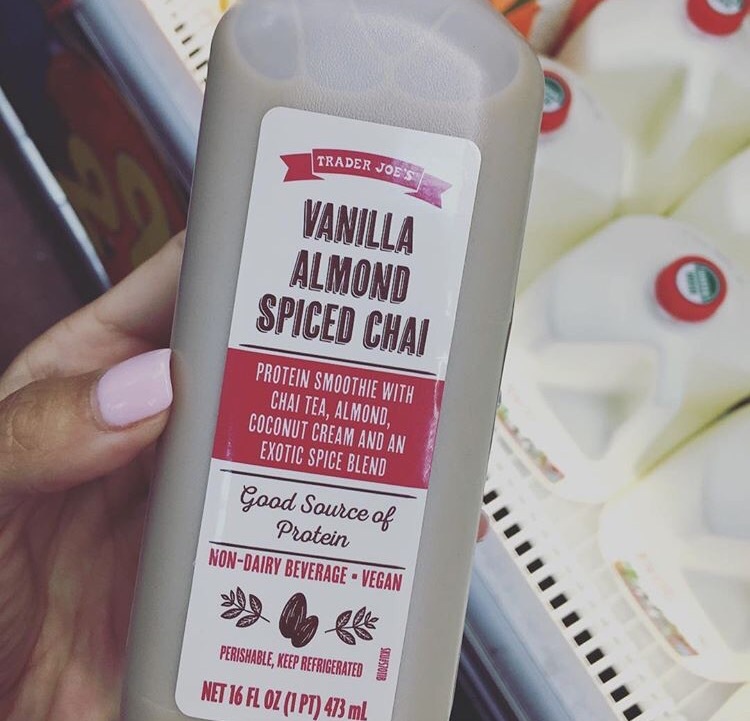 Vanilla Almond Spiced Chai Protein Smoothie Everything I like in one bottle. 10. Ultra Moisturizing Hand Cream I have the driest hands so this is a must try! For all you Trader Joe's veterans, any products that are a MUST? Let me know in the comments. For all you readers, get ready for the slew of TJ's products that will soon be seen all over Take A Bite. For all you OKCers, I'll see you Friday. And after you all swoop up a jar of cookie butter make sure you put it to use by making my Cookie Butter Popcorn, Cookie Butter Rice Krispies or just by the spoonful, whatever you prefer. p.s. I trust Gaby and Monique with all things food. Check out their full lists of favorites here, here and here.